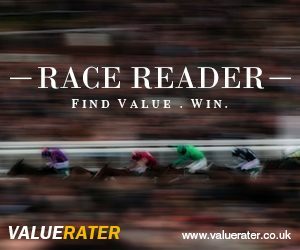 The Race Reader Service is the flagship service from Value Rater, and is run by VR founder Matt Mitter. This service is interested in value prices and a long term approach to making significant profits but if you want to back 2 or 3 short priced favourites a day on low grade racing then the Race Reader private service won't be for you. Matt specialises in better quality racing as he feels there is often a significant edge the bookies have missed and then his members go in accordingly. As a long term project members are encouraged to use a betting bank and bet professionally using discipline. Matt says to expect Race Reader bets with full analysis Tuesday to Saturday and every day of major UK festivals. As subscription to Race Reader costs £50 per month or better value can be gained from a quarterly membership at £99.99 effectively giving you one free month in every three. Geegeez readers can also take the first month for just £12.50 via this link or by clicking any of the highlighted links on this page. Ernest Anthony is now going to review Race Reader for an initial period of 60 betting days, using a £10 per point stake at advised and verified odds. An encouraging start to this service as it was mostly in profit for the first 17 days. However this was not to last as the next 18 days were all losing and a profit of +2.9 points became a deficit of -37 points. I personally feel it is difficult for a service to recover from this position. Although having said that we were at Day 37 - still another 23 days to go. There was a mini revival and the deficit was reduced to -20 points. Sadly this did not last and 1 win in the next 9 nine days surely sealed the fate of this service plunging in to a low of -39 points and we were on Day 59. A winner of 19 points on the last day brought the deficit to -20 points. A service should have to rely on big priced winners to make a profit if that is not their speciality which I believe was not the case with this service as it had 60 days to get this across.